Director/Producer – Robert Aldrich, Screenplay – Lukas Heller, Based on the Novel by Henry Farrell, Photography (b&w) – Ernest Haller, Music – Frank DeVol, Special Effects – Don Steward, Makeup – Monty Westmore, Art Direction – William Glasgow. Production Company – Associates and Aldrich/Seven Arts. It is 1917 and Jane Hudson is an enormously popular variety show child star. She is able to get anything she wants and throws tantrums when she does not get it. She is envied by her sister Blanche who vows to one day get even. Blanche’s opportunity comes in the 1930s when she becomes a Hollywood star and Jane is a has-been who has sunken into alcoholism. As the two sisters drive back from a party one night, one gets out to open the gate and the other slips the car into gear and drives forward at them. The accident leaves Blanche paralysed from the waist down. Thirty years later, Jane is left tending the wheelchair-ridden Blanche. However, Jane’s sanity has snapped and she cruelly tortures the helpless Blanche, keeping her imprisoned and feeding dead rats and her pet bird up to her. 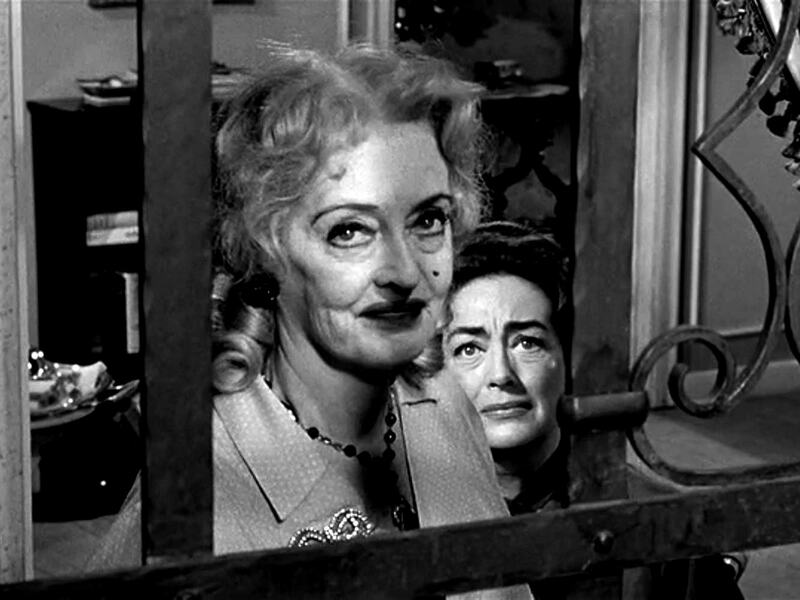 With the exception of Psycho (1960) and to a lesser extent Les Diaboliques (1955), What Ever Happened to Baby Jane? is the film that had the greatest influence on the prolific psycho-thriller genre of the 1960s. It gave an entirely new impetus to the flagging careers of Joan Crawford and Bette Davis, both former Hollywood stars beyond their glory years who subsequently found new careers in horror movies. Indeed, What Ever Happened to Baby Jane?, with its sight of former Hollywood stars over the hill and going round the bend, created a lurid pseudo-tabloid sub-genre of Grand Guignol Hollywood self-devouring (one that had its antecedent in Gloria Swanson’s swan song, Sunset Blvd. (1950), which was almost a horror film). What Ever Happened to Baby Jane? was followed by a cycle of Grand Guignol psycho films featuring over-the-hill female stars – Olivia De Havilland appeared in Lady in a Cage (1964), Tallulah Bankhead in The Fanatic/Die, Die My Darling (1965), Eleanor Parker in Eye of the Cat (1969), Shelley Winters in What’s the Matter with Helen? (1971) and Whoever Slew Auntie Roo? (1971), Ruth Roman in The Baby (1972), Lana Turner in Persecution (1974), while both Bette Davis and Joan Crawford appeared in several lookalike films – Davis in Hammer’s The Nanny (1965) and The Anniversary (1968), and Crawford in Strait-Jacket (1964), I Saw What You Did (1965) and Berserk (1967). Indeed, Joan Crawford’s own life story was even turned into a Batty Old Dames film of sorts with Mommie Dearest (1981). When What Ever Happened to Baby Jane? came out, a large part of its success was the shock of seeing the two former stars reduced to monsters. The horror in the film fails to translate so well to today’s teen and twentysomething audiences who often find the film dated and ludicrous because they are not conversant with the film’s context – that it represented a shock trashing of two of the icons of Hollywood glamour in the 1940s. Bette Davis in particular shocked everybody with her completely over-the-top performance. It is a real theatre-rattling barnstormer of a delivery that she gives – and one that garnered her a Best Actress Academy Award nomination. She goes totally bonkers and the results are fascinatingly grotesque to watch. The scene where she in cracked, gargoyle makeup sings a song I’ve Written a Letter to Daddy in a cracked, girl-like voice is a masterpiece of the memorably bizarre and twisted. Joan Crawford’s fine performance was not unexpectedly overshadowed by Bette Davis but is one that elicits a good deal of pained sympathy. Although such is something that the film seems to misunderstand. The final twist in the ending mutes the horror – seeming to imply that we should forgive Jane for what she has done as Blanche deserved it. A good deal of the venom between the characters was apparently something that existed between the two actresses in real-life with both delighting in spitefully nasty games of one-upmanship on the other on set – there was even a book written about such Bette and Joan: The Divine Feud (1989) by Shaun Considine and later a season of the tv series Feud (2017– ). The irony that only came out in later years is that the roles were uncommonly close to the truth upon the parts of both actresses – Joan Crawford and Bette Davis were both utterly vain, particularly when it came to their own celebrity, both abused their own family members and both had daughters who wrote books about the cruelty of their parents. Director Robert Aldrich has the power to shock at his disposal – the dead rat scene always has gross-out impact. There are the odd moments of suspense – the move down the stairs and the balled-up note – although there are also times when the film seems talky, almost too stagy, and needs more drive and tension. Indeed, What Ever Happened to Baby Jane? is a film whose effect lies with the barnstorming theatrics of its two stars rather than as a straight psycho-thriller. (It would make a very interesting revival as a stage play). There is fine black-and-white photography, which only serves to bring out the deliberately unglamorous making-up of its two stars. The other Academy Award nominee among the cast was Victor Buono as Supporting Actor – there is a sly amusement to the scenes with his mother and a piquant charm to his clumsy English mannerdness in the scenes with an outrageously flirting Bette Davis. In recent years, What Ever Happened to Baby Jane? has gained the status of a gay cult classic because of its campy over-acting. 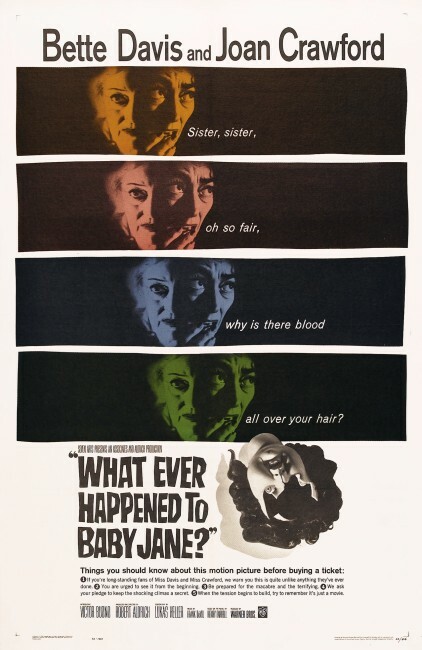 The film was later blandly remade as a tv movie What Ever Happened to Baby Jane? (1991), which was executive produced by Robert Aldrich’s son William. In a piece of freakish stunt casting, the Joan Crawford and Bette Davis roles were played respectively by real-life sisters Vanessa and Lynn Redgrave. 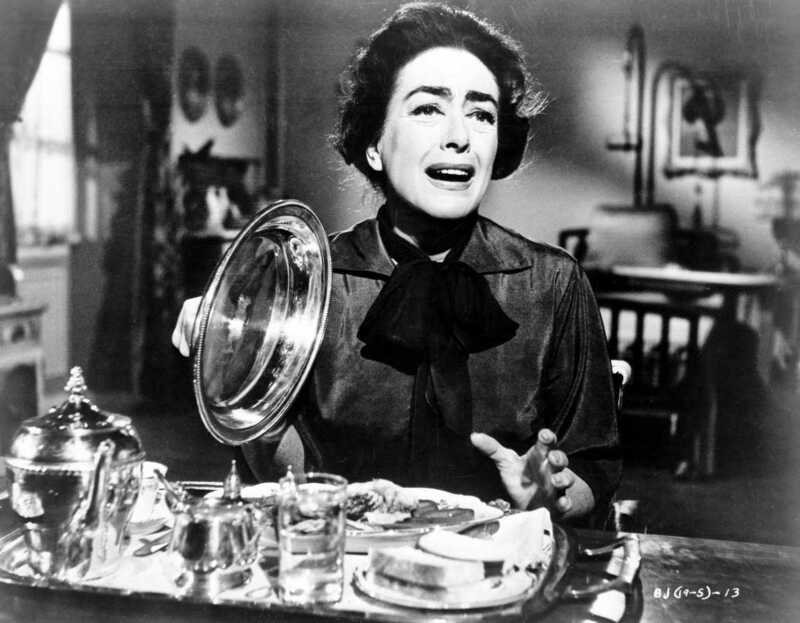 The story of the making of the film and the bitter rivalry between its two stars became the basis of the first season of the tv series Feud (2017– ) with Jessica Lange as Joan Crawford, Susan Sarandon as Bette Davis and Alfred Molina as Robert Aldrich and unnervingly examines the making of the film in detail, including the restaging of many scenes, and the bitter fallout from it. Robert Aldrich later returned with Bette Davis (and it was originally intended Joan Crawford who quit/was fired in mid-production because of the rivalry with Davis) in a follow-up of sorts Hush … Hush, Sweet Charlotte (1964), which is a much better film, if not as famous. Also of interest is Robert Aldrich’s The Killing of Sister George (1968), which returns to the same Hollywood Grand Guignol as What Ever Happened to Baby Jane? although is not a horror film, and his The Legend of Lylah Clare (1969), where a producer attempts to turn Kim Novak into a replica of his dead wife, which hovers for a time on the edge of being a ghost story. In the Hollywood Guignol stakes, Aldrich also produced a further Batty Old Dames psycho film What Ever Happened to Aunt Alice? (1969) and Bert I. Gordon’s Picture Mommy Dead (1966) where the spirit of Zsa Zsa Gabor haunts her daughter from out of a painting. Robert Aldrich had a celebrated career that stretched between the 1950s and 1980s, making films such as The Dirty Dozen (1967), The Longest Yard (1974) and The Choirboys (1977). He made several other films of genre interest, including the quasi-sf Mickey Spillane adaptation Kiss Me Deadly (1955), which is perhaps one of the finest of all Hollywood film noirs, and the nuclear missile silo hijacking thriller Twilight’s Last Gleaming (1977). Novelist Henry Farrell, whose 1960 novel the film was based on, also developed a film career as a result of What Ever Happened to Baby Jane?. Farrell furnished the script for Robert Aldrich’s Hush … Hush, Sweet Charlotte, the novel for the Curtis Harrington-directed Baby Jane copy How Awful About Allan (1970) and the script for Harrington’s What’s the Matter with Helen? (1971), as well as scripts for two tv movies, the haunted house drama The House That Would Not Die (1970) and the clairvoyance thriller The Eyes of Charles Sand (1972).